This walking holiday explores Croatia's national parks; the jagged peaks of Dalmatia, plunging gorges in Paklenica and spectacular lakes and waterfalls in Plitvice. Stay in the capital Zagreb and in coastal Spilt meander the maze of cobbled streets past ancient sites. Joining the tour today in the evening we meet with the group and the Tour Leader. Today we start our day with a city tour of Zagreb. Famously called a city of museums as there are more museums per square foot than any other city in the world it also has many other architectural structures to boast of. Later in the afternoon we drive down to the magnificent beauty of the Plitvice Lakes, a sumptuous setting of forested hills and beautifully clear lakes that are, with good reason, Croatia's premier tourist attraction. Travertine terraces cascade down through the lush landscapes, presenting the visitor with a series of plunging waterfalls and turquoise, calcium rich lakes that are one of Europe's natural marvels. Little wonder then that this remarkable park was awarded UNESCO World Heritage status in 1979. Today we plan to spend our time walking a track of which the second half provides us with far reaching views of the lakes, waterfalls and surrounding pine clad hillsides from a higher vantage point. Over the millennia, the waters of these lakes have dissolved the limestone rock and carved out the valley in which they now lie. Through the sedimentation of calcium carbonate and the build up of special types of algae and moss, minerals have been deposited to form the natural dams that separate these lakes. The dynamic process still continues today, creating new falls as the water breaks through the slow growing barriers. Our route today gives us the opportunity to experience the rich variety of flora in this region, ranging from reeds, bull rushes and willow trees, which shade the lakes and line the wooden walkways, through to the myriad orchids of cyclamen, scabius and smoke bushes which can be found beneath the predominantly oak and beech forests. Today's 14 kilometre walk to is expected to take around five hours with 140 metres of ascent and descent. After breakfast, we transfer to Zavizan to walk the Premuziceva Trail. The top parts of northern and central Velebit from Zavizan to Baske Ostarije are connected by a 57km long hiking trail. It was named after its designer, Ante Premuzi, the great builder of roads and trails on Velebit. The construction of the trail took only 3 years (1930 - 1933), but it required the labour of a large number of workers from sub-Velebit villages. The trail opened access to the most hidden and the most beautiful parts of Velebit. Later we will transfer towards Paklenica National Park, which lies on the southern edge of the imposing limestone mass of the Velebit Mountains. The impressive mountains that make up this breathtaking landscape present an almost continuous wall of rock, rising up to separate the waters of the Adriatic from the rolling landscapes of the interior. This region contains some of the most spectacular walking country in Croatia, with majestic karst landscapes, plunging gorges and jagged mountain peaks to enchant and captivate the visitor. Today's 16 kilometre walk to is expected to take around five-and-a-half hours with 280 metres of ascent and descent. After breakfast this morning we will depart the hotel and follow a trail that passes the villages lining the coast. Along this coastal area the rocky slopes tend to be favoured by a thick blanket of maquis and scrub which leads down to isolated pebble beaches. We will have the opportunity to swim undisturbed in the crystal clear water before stopping for lunch (optional). With the fabulous backdrop of the stark Velebit mountains we will have the chance to watch the changing colours of the sky and the sea as the sun sets on the coast, bring our first day in the region to a close. Alternatively we can extend our walk this afternoon into the foothills of the Velabit Mountains, passing through the Mirila (stone monuments to the deceased). Dating back to the 17th Century the people here made their living from animal husbandry and lived and died in the Velabit Hamlets. Mirila offers us an unique insight into the customs and the way of life of the early Dalmatians. This morning's 10 kilometre walk is expected to take around five hours. This can be extended by eight kilometres with 200 metres of ascent and descent to make the total walk seven hours. A full day in the park sees us follow a different route, affording us with a variety of entrancing views. Leaving the hotel by jeep, we will follow a zigzag road with stunning views of the coast, stopping for a visit at the centuries old Mirila; stone monuments signifying the place where the departed would greet the sun for the last time. We then continue on foot to the abandoned summer village of Ramici, occupying the Njive Plateau. Making our way through the broadleafed forest we then descend into the upper reaches of the gorge, following a mountain trail lined with fragrant thyme and sage, all the while surrounded by stunning views of the dramatic karst gorge. We take our time as it is uneven terrain. Continuing up the gorge we will stop for lunch at a traditional mountain hut before returning through the spine of the gorge along a gentle stream. We wind our way through the window and chimney bellflowers and smoke bushes with a steep decent out of the gorge. There is the option to descend the other side of the gorge and continue our walk along pine forested paths, returning to the hotel via a steep ascent with far reaching views. As our route circles back towards the hotel it meets the coast, affording some opportunities for a refreshing swim, if time allows, before we head back for dinner. 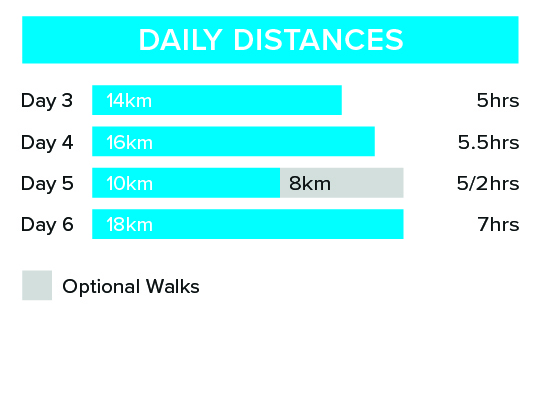 Today's 18 kilometre walk to is expected to take around seven hours, the easier 10 kilometre option is expected to take around four-and-a-half hours. Please note this walk is weather dependent, if it is not available the Tour Leader will suggest the shorter walk. Today we transfer to Split. En route we stop at Trogir with free time for sightseeing and optional lunch. Trogir has a rich history that dates back to the 3rd century BC, with a delightful collection of cobble stoned squares and medieval architecture, and a Romanesque cathedral that is considered one of the most exquisite in the entire Adriatic. Spanning some three centuries it boasts a superb entranceway in its west portal, carved in the 13th century by the master mason Radovan. The town also boasts Venetian Gothic mansions, an impressive clock tower and a comprehensive collection of church artwork displayed in the 13th century Church of St John. What makes Trogir such a delight to wander around though are its meandering alleyways, filled with cafes and restaurants and its elegant riverfront promenade, which leads up to the Kamerlengo Fortress, a 15th century edifice with imposing battlements and a huge octagonal tower. After lunch we continue towards Split. Today's Split is the product of 17 centuries of building, renovating and remodelling. There is time to wander the streets independantly or take an optional guided walking tour of the city, you may wish to visit the Diocletian's Palace (optional). The Diocletian's Palace is a well preserved Roman monument and became the mausoleum of the pagan Roman emperor. The building evolved with time into the world's oldest Roman Catholic church, today it is an intriguing maze of narrow cobblestone streets where pre Romanesque churches nestle alongside Gothic chapels. The tour ends in Split this morning after breakfast. We recommend you bring lightweight trail/walking shoes with ankle support. Make sure that your boots are worn-in and comfortable before the start of the trip. Also trainers or sandals for relaxing and general wear and it may be advisable to pack some waterproof shoes for rocky beaches. We suggest that on international flights you either carry your walking boots in your hand luggage or wear them - should your luggage be lost or delayed, your own boots are the one thing that will be irreplaceable. Walks on 4 days for an average of 5 hours. Follow boardwalks, forest paths and well-defined mountain trails, of which some sections are uneven and rocky underfoot.